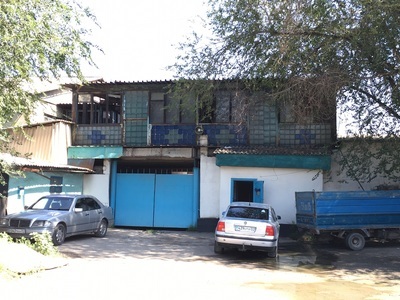 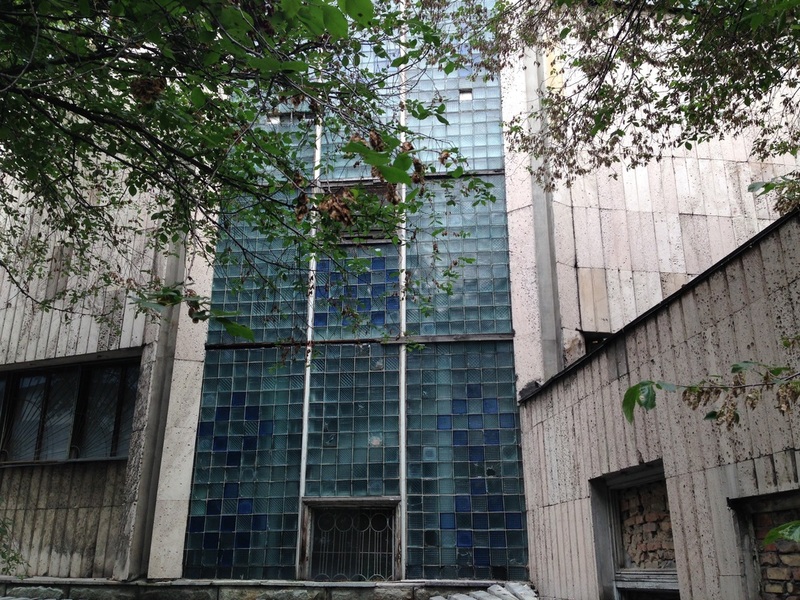 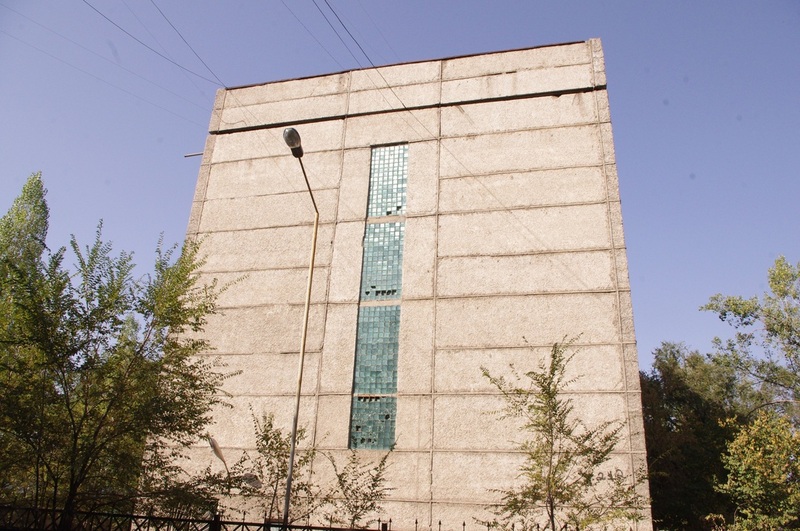 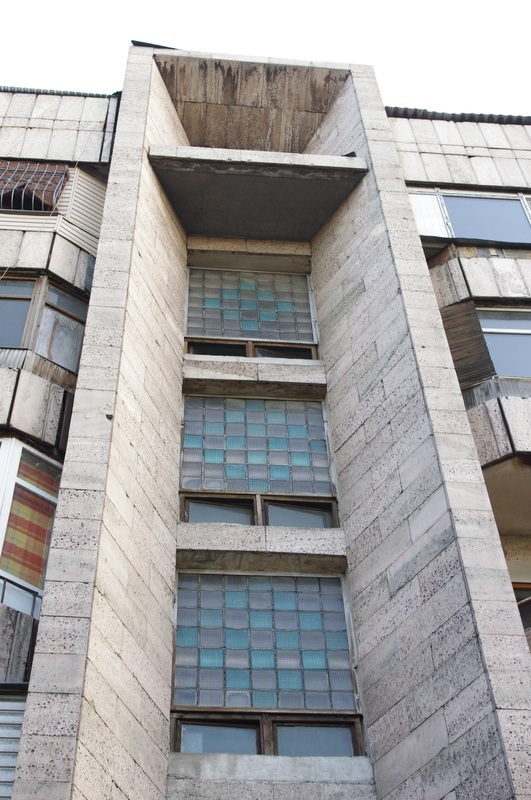 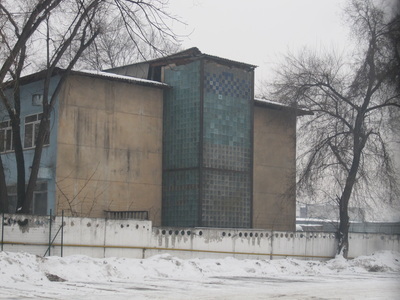 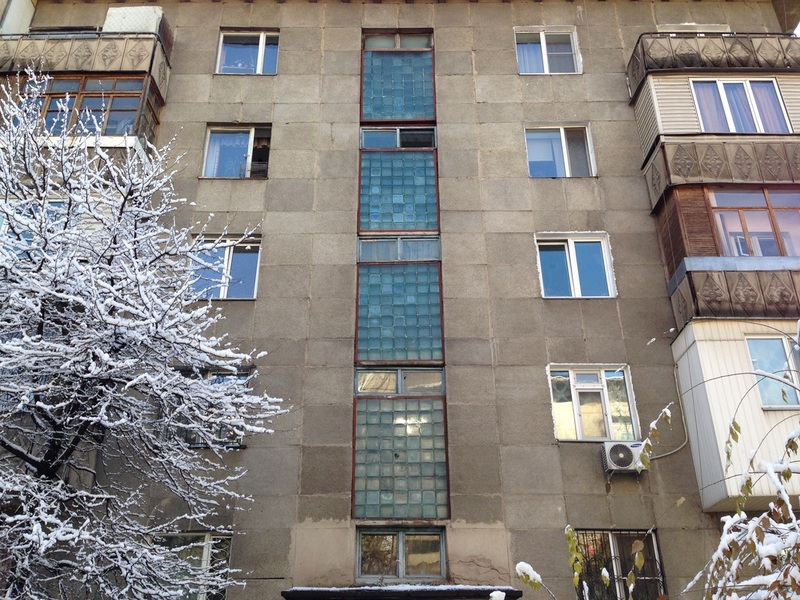 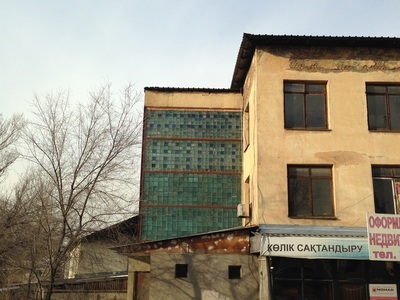 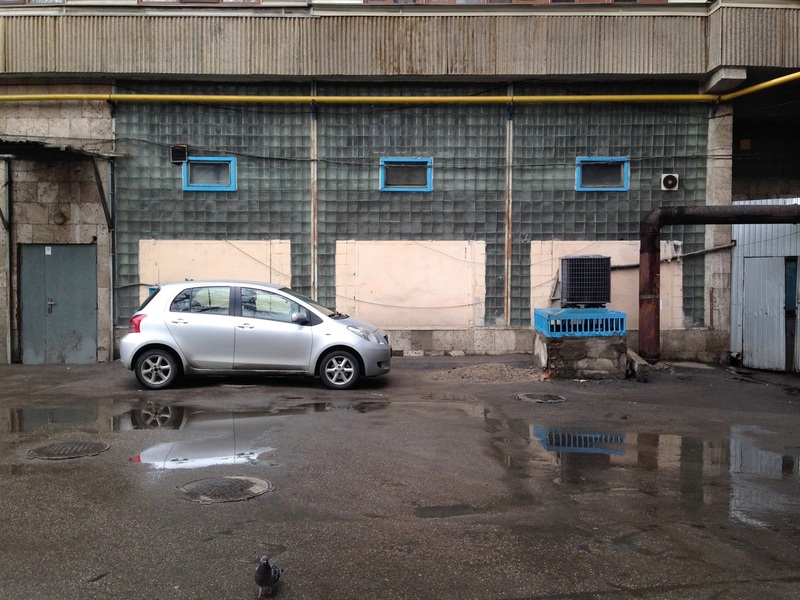 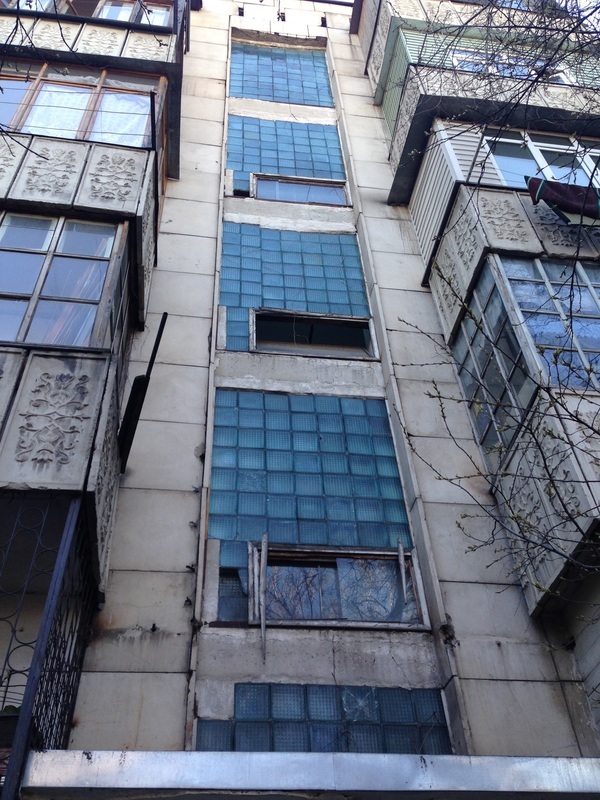 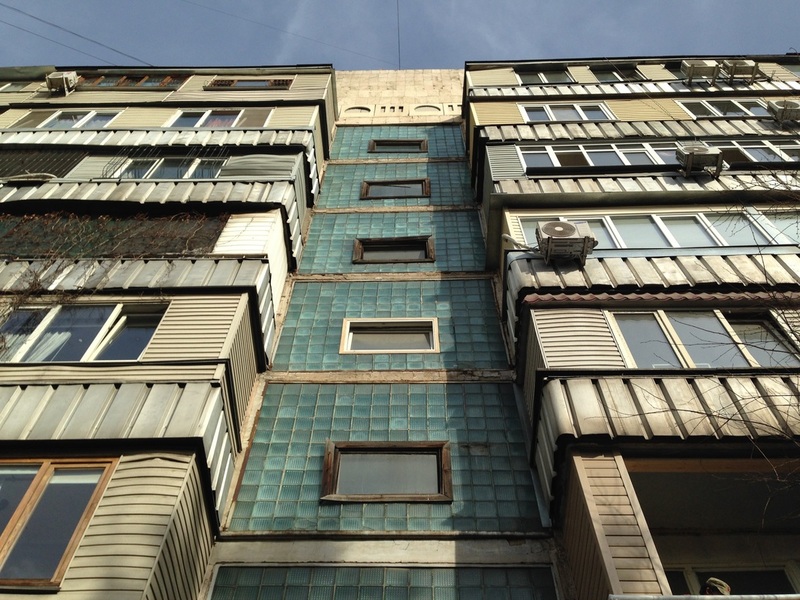 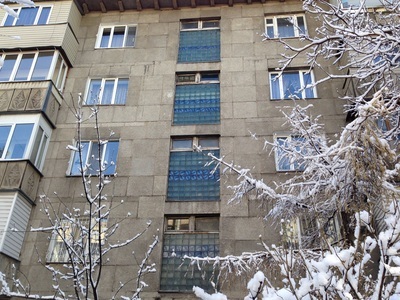 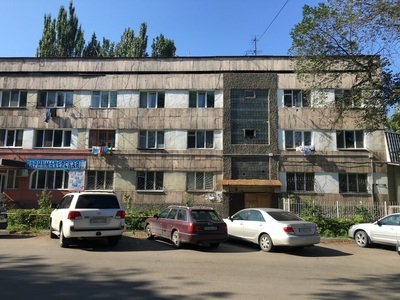 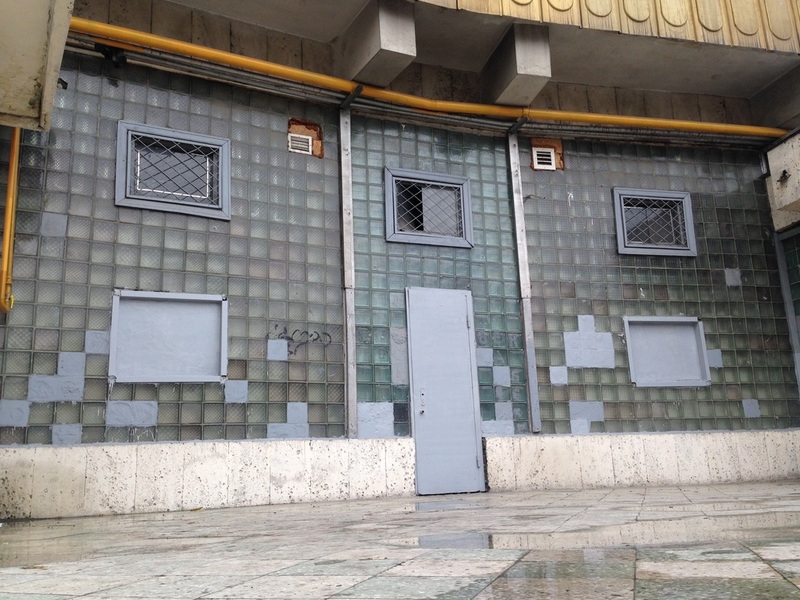 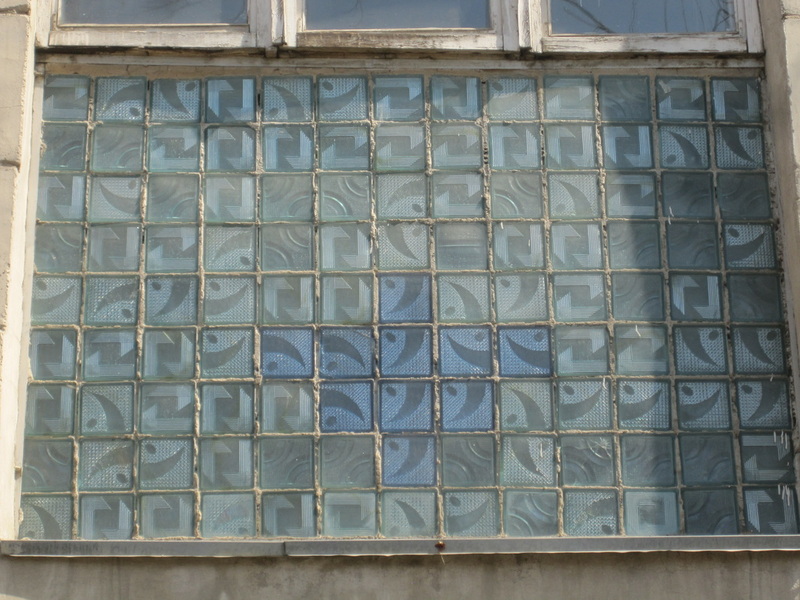 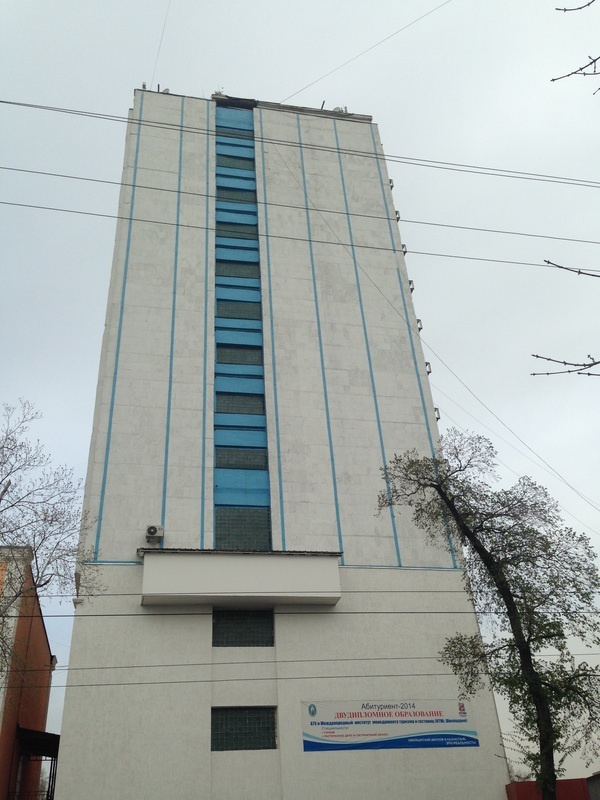 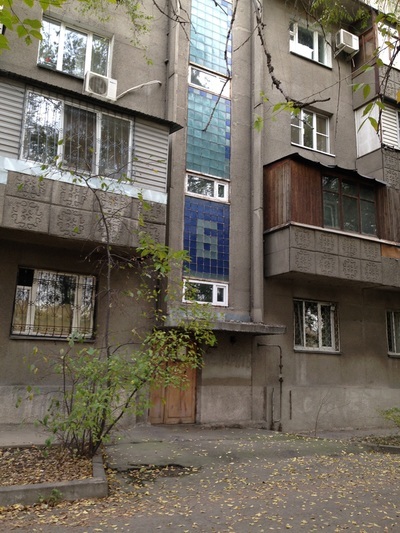 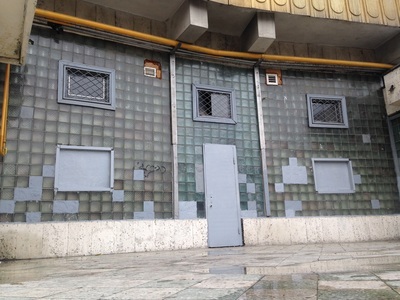 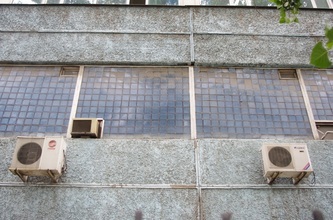 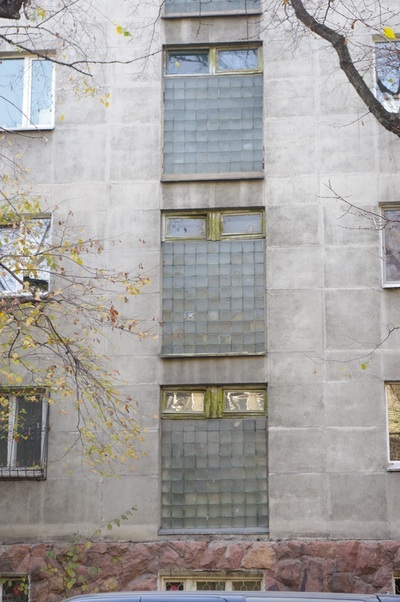 The glass block, or stekloblok [стеклоблок], was a favorite medium for Soviet architects. 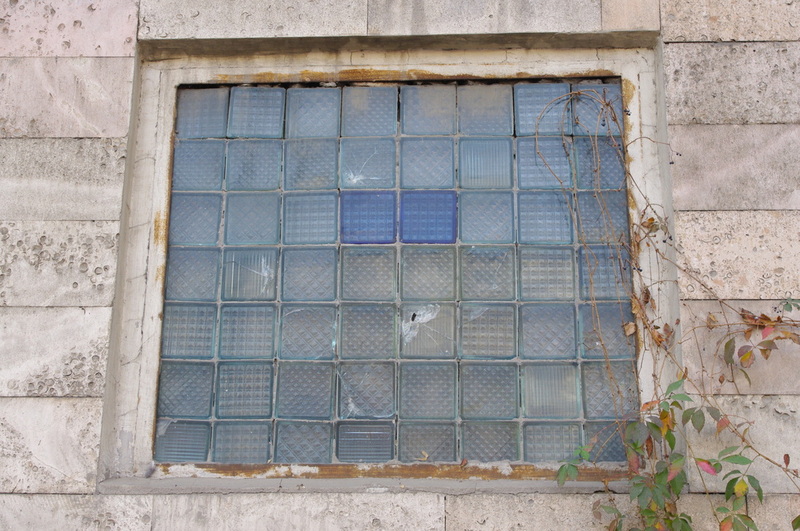 The blocks were first developed in the early 1900s for use in factory walls, where they were meant to let in ample light for workers while offering insulation and durability. 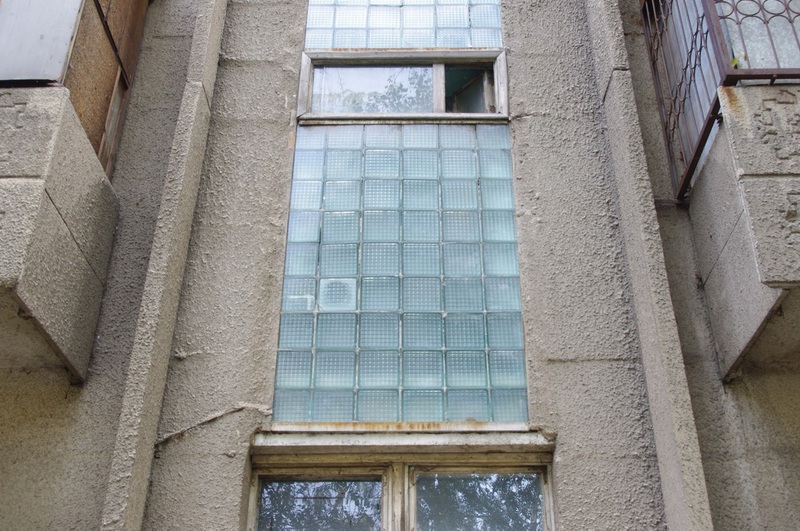 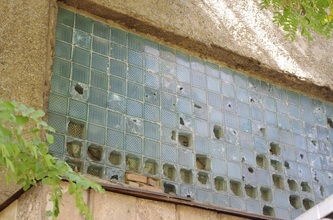 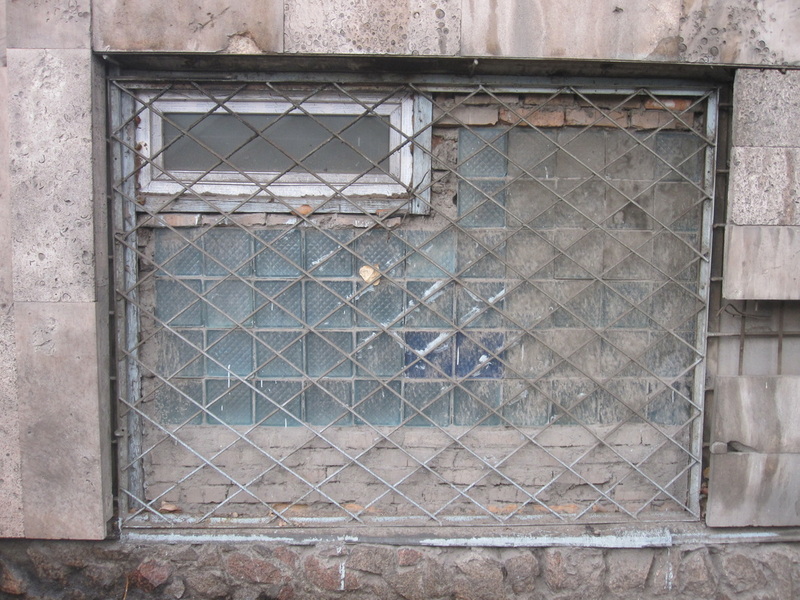 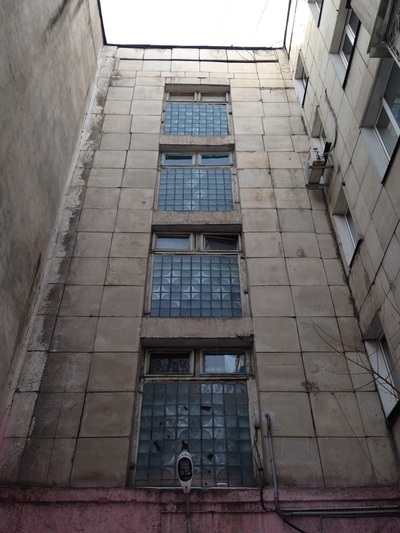 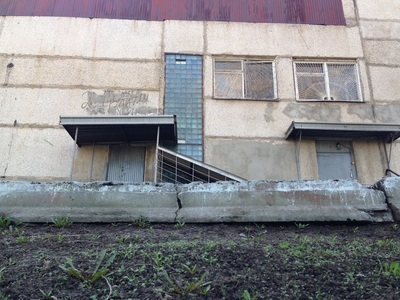 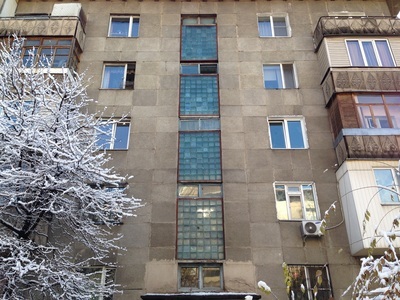 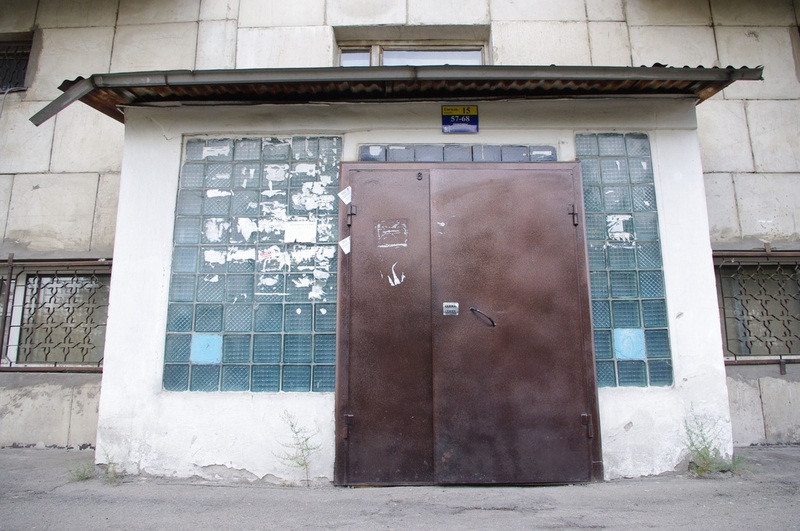 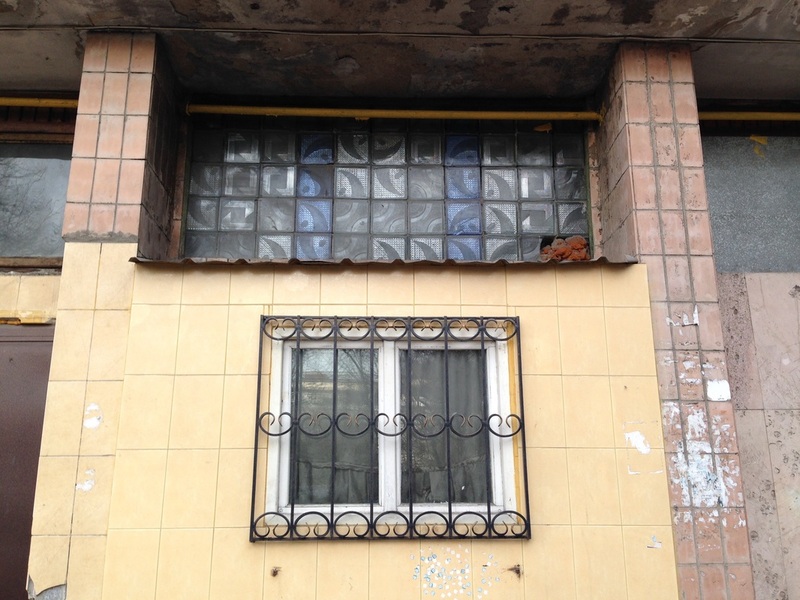 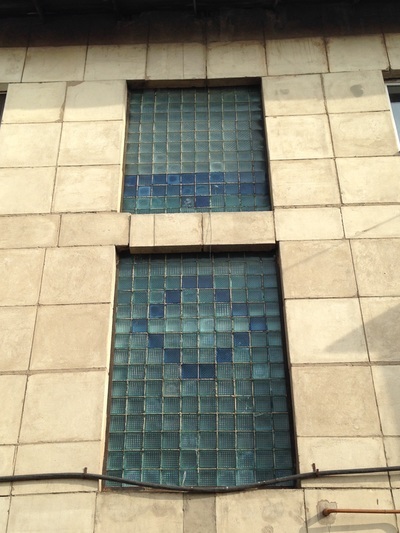 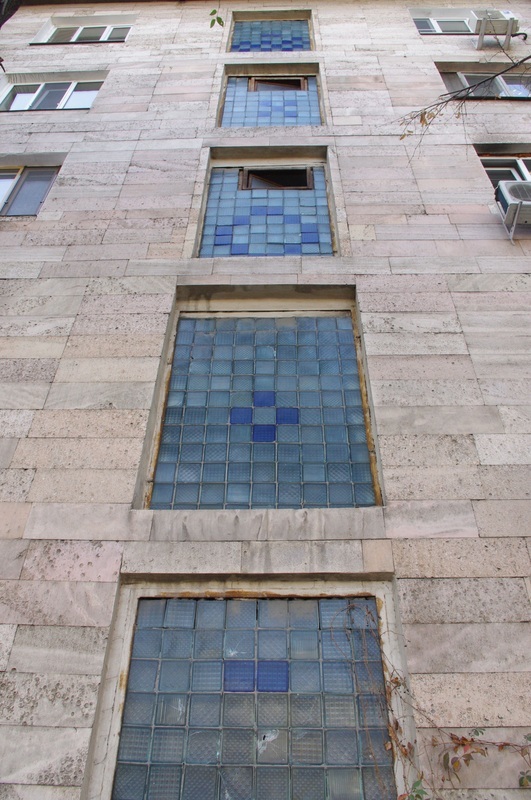 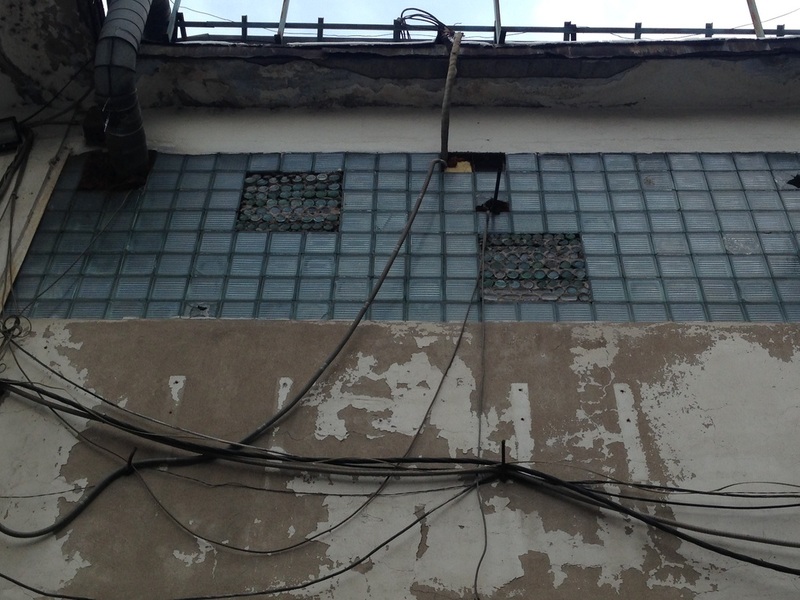 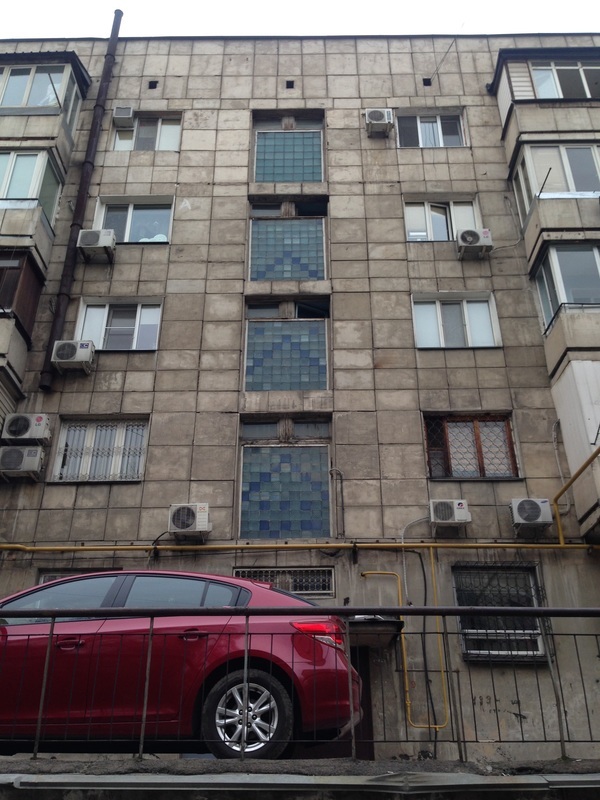 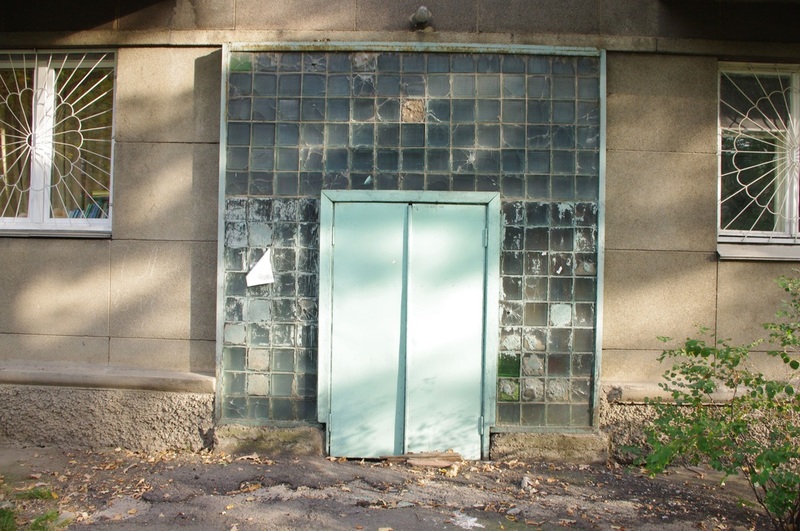 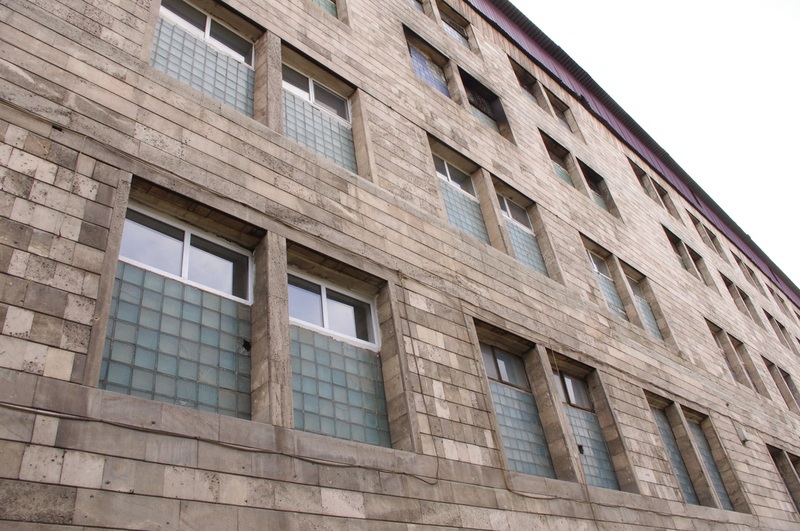 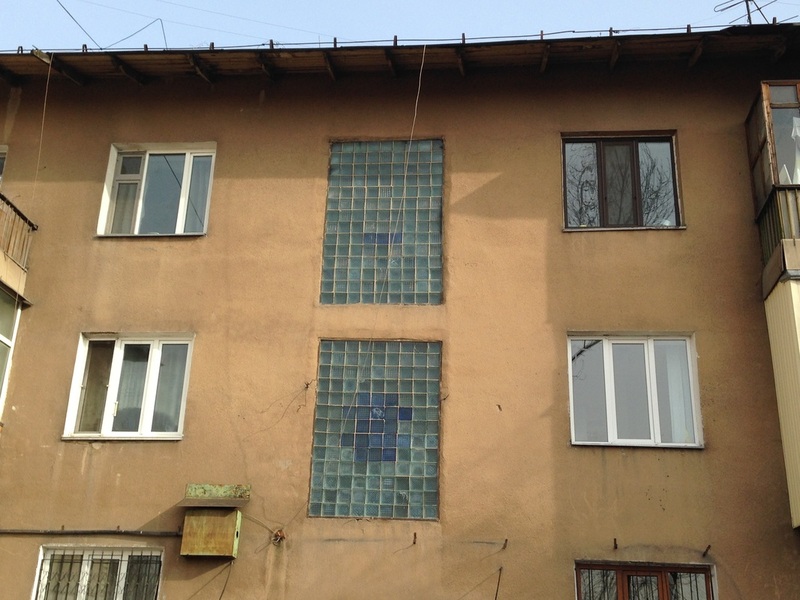 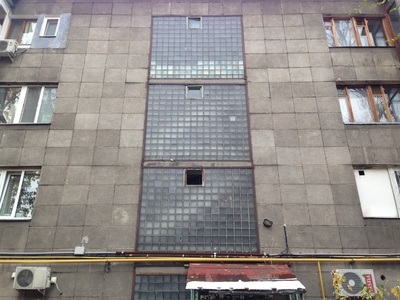 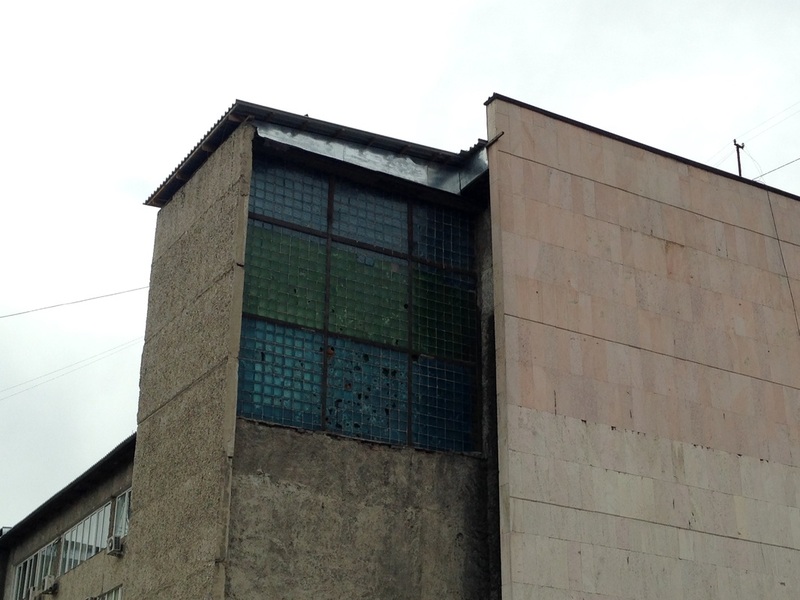 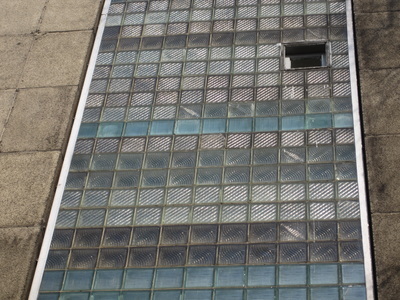 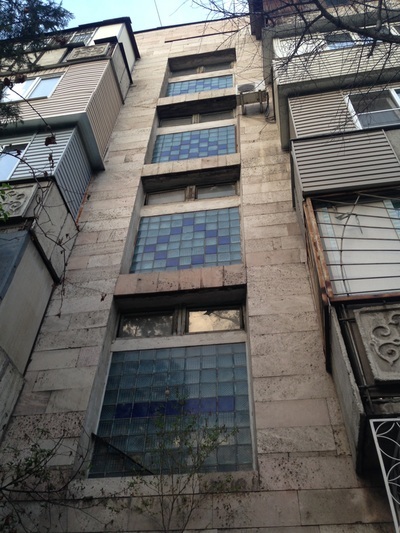 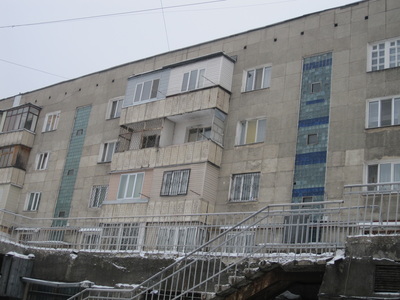 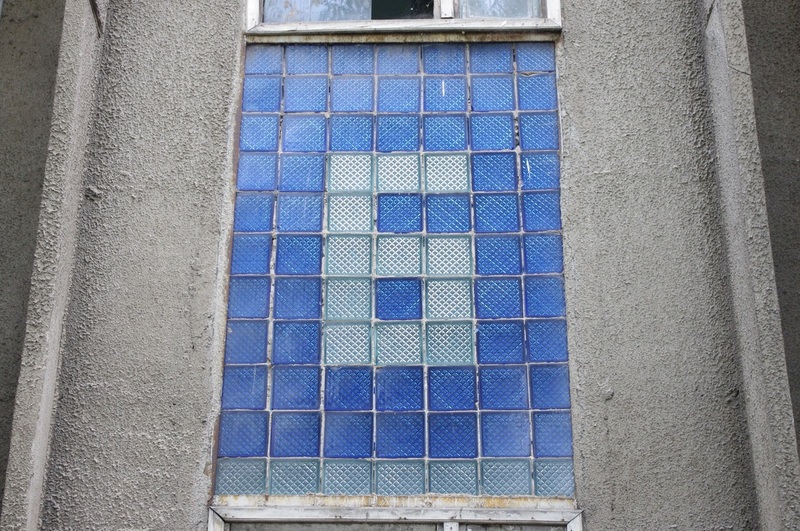 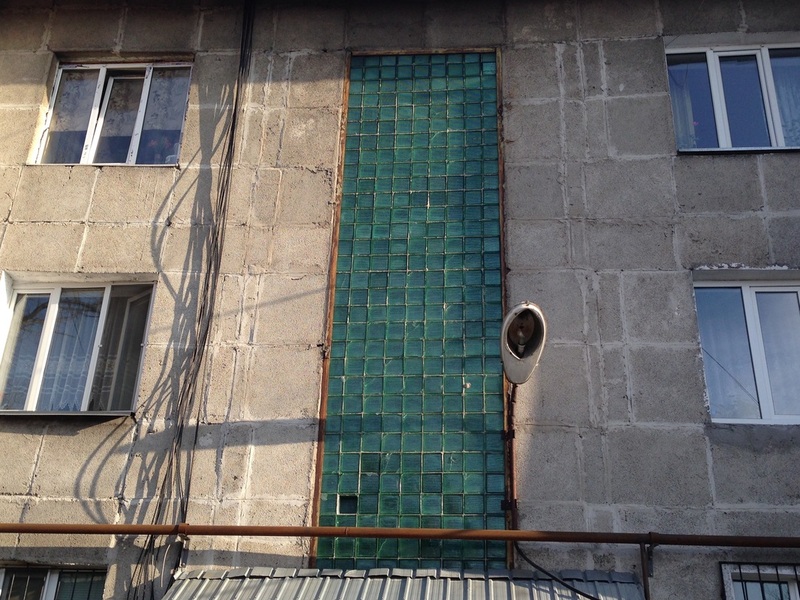 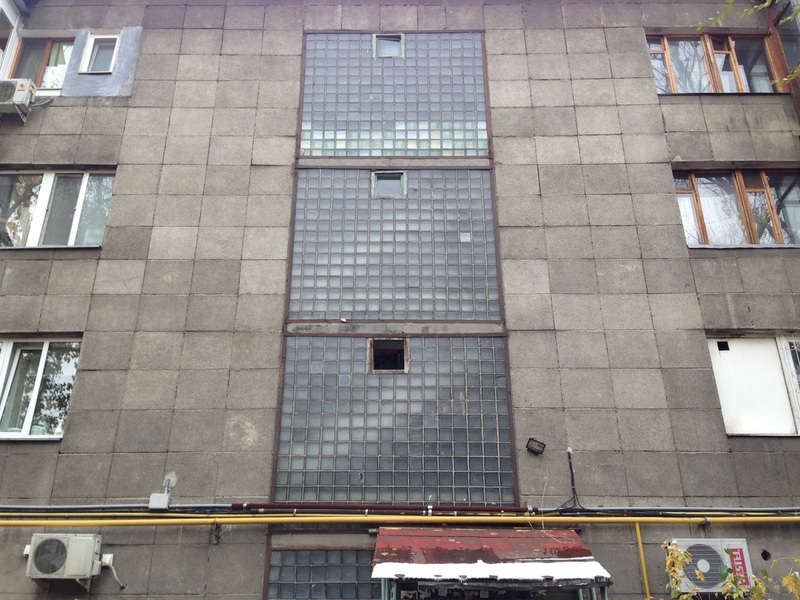 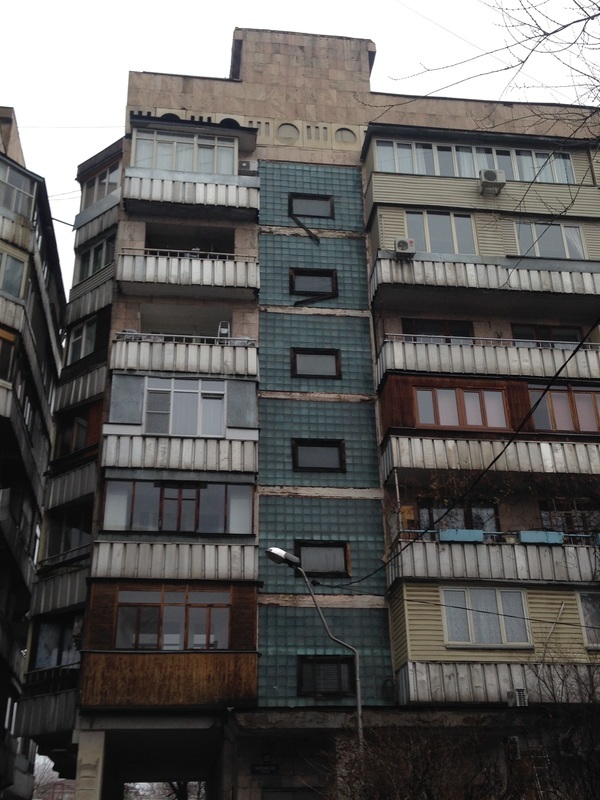 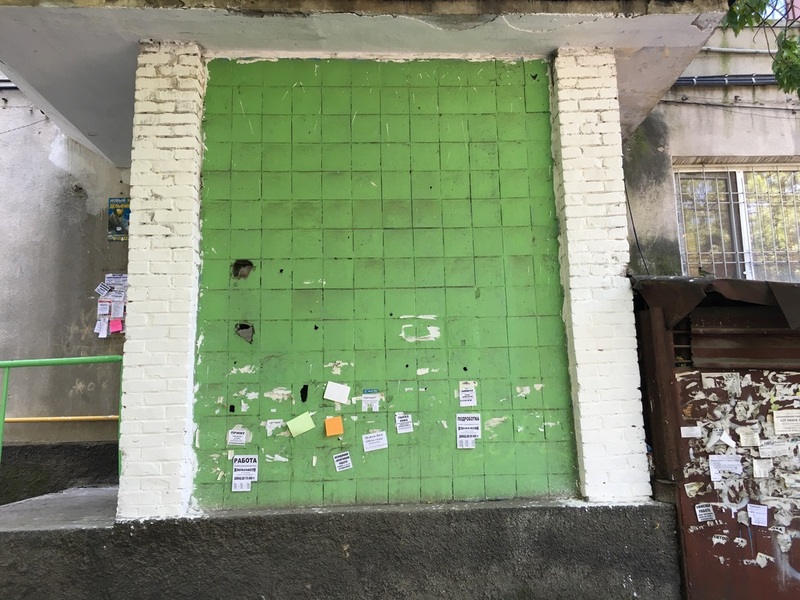 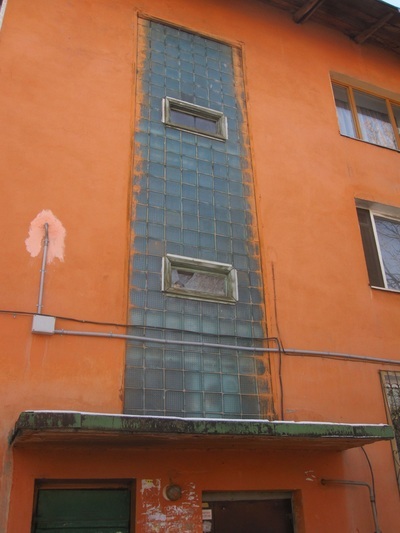 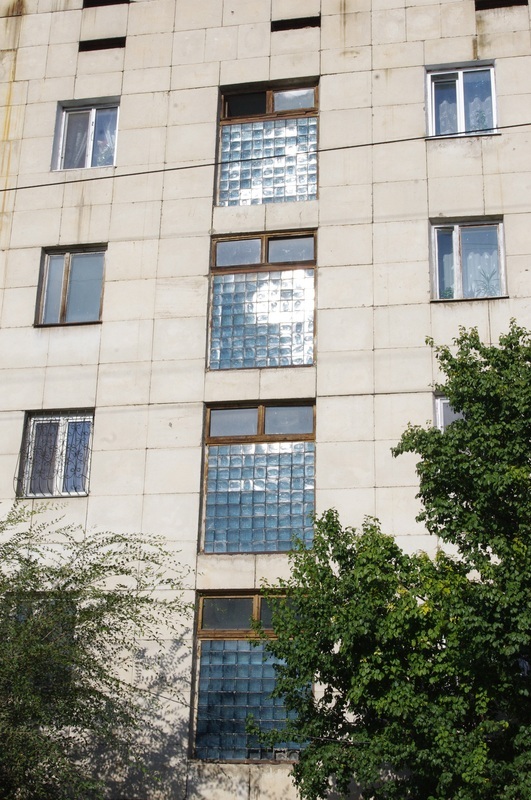 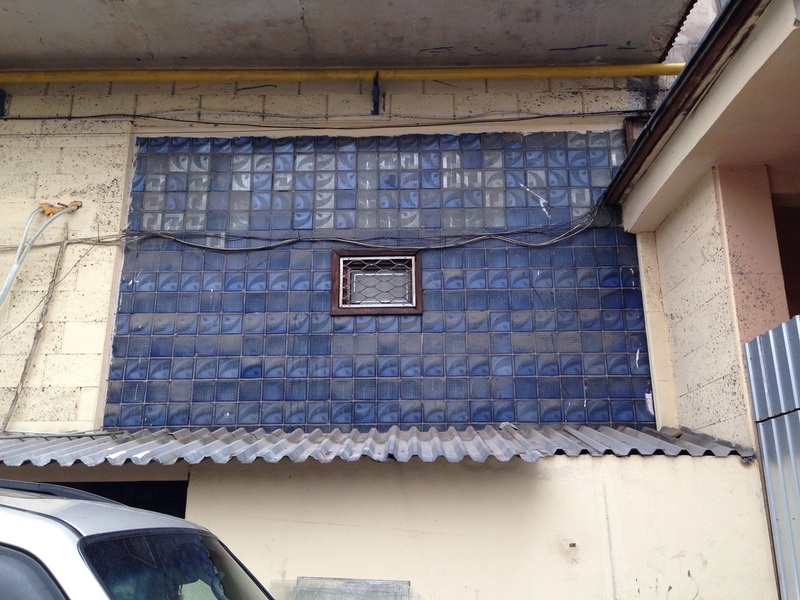 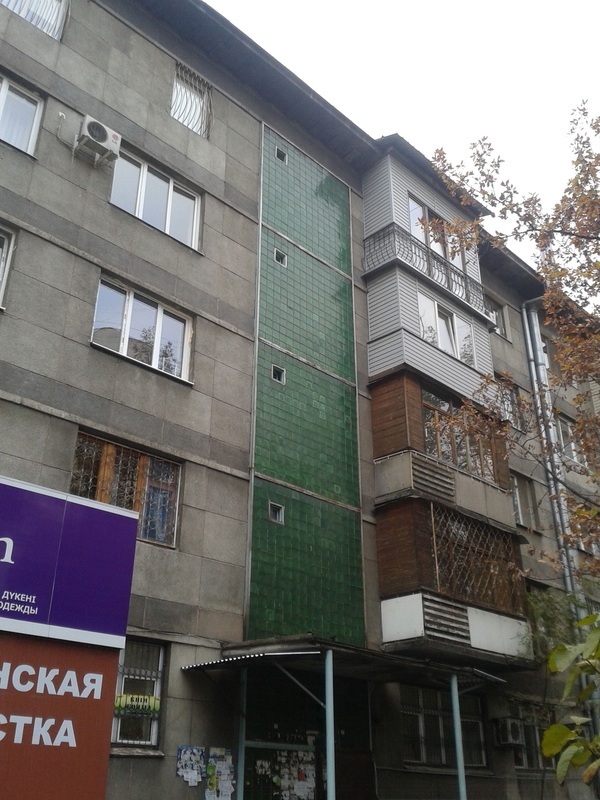 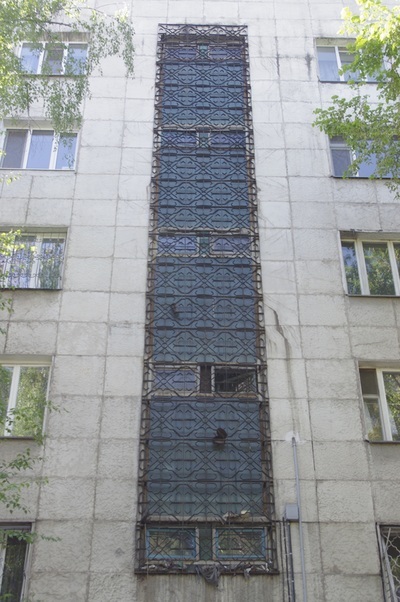 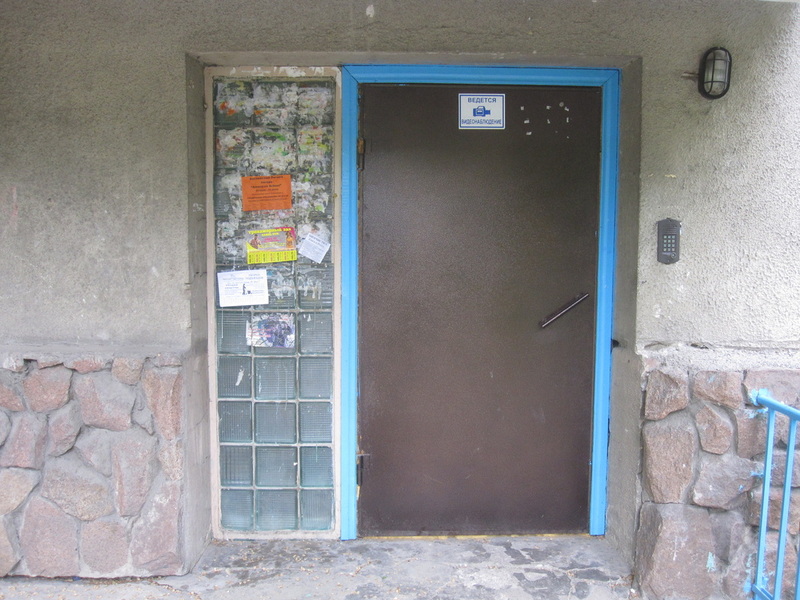 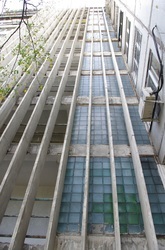 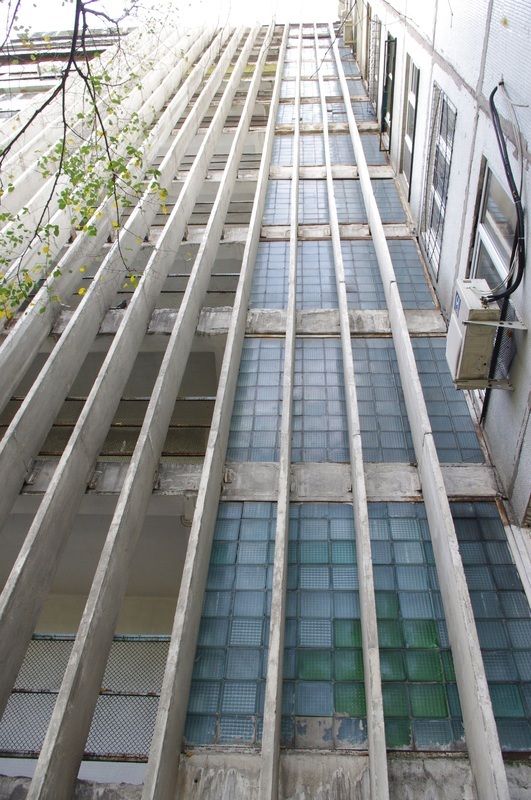 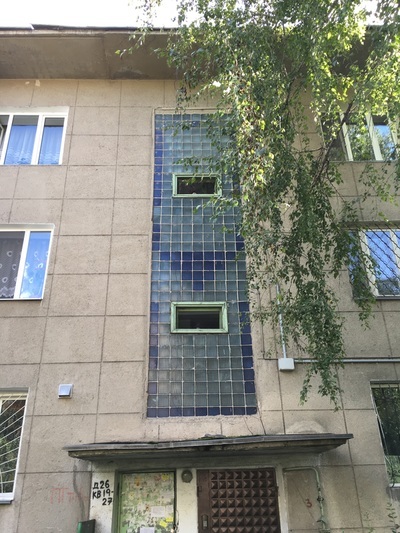 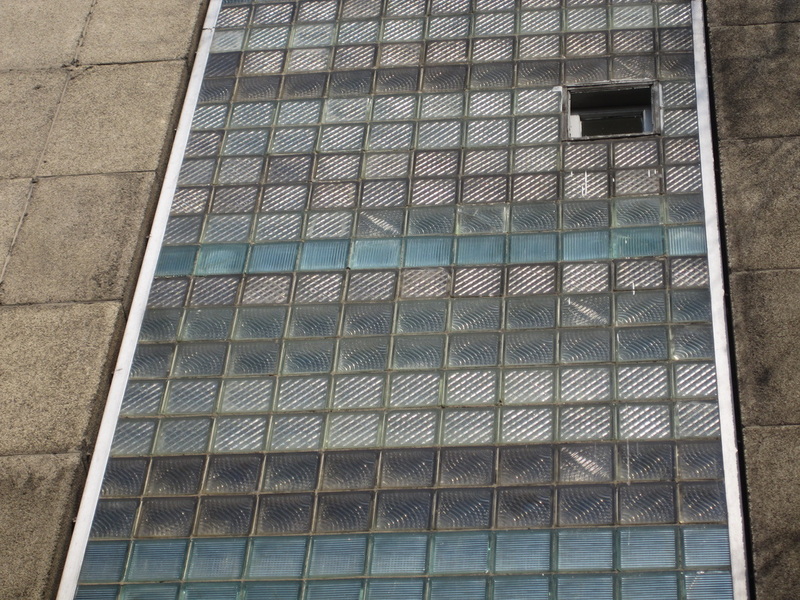 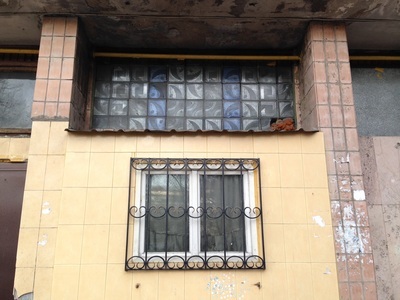 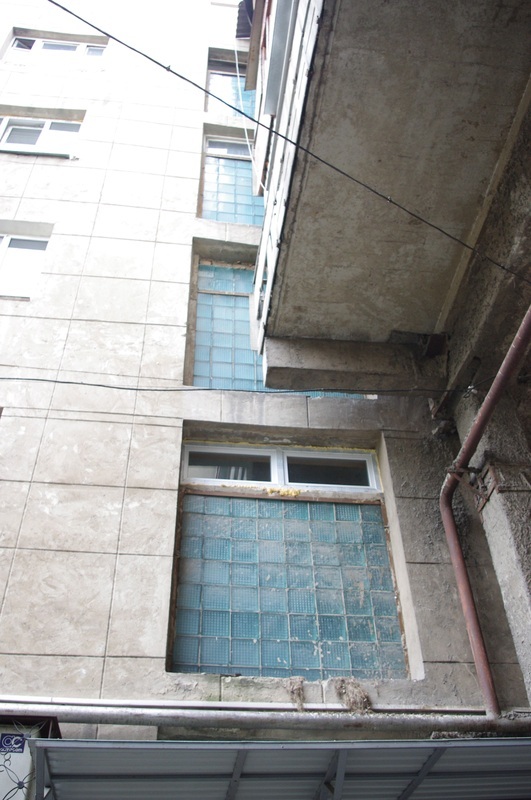 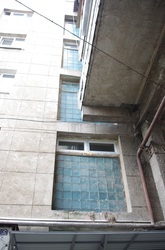 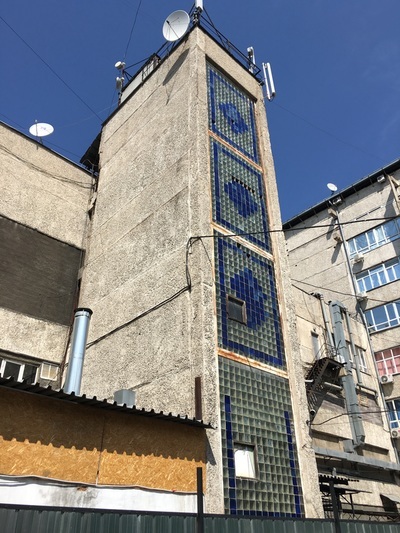 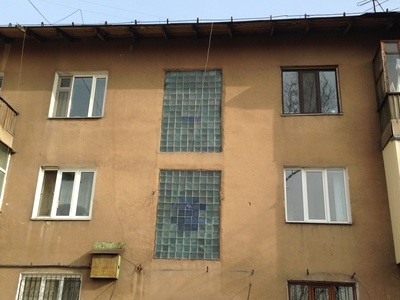 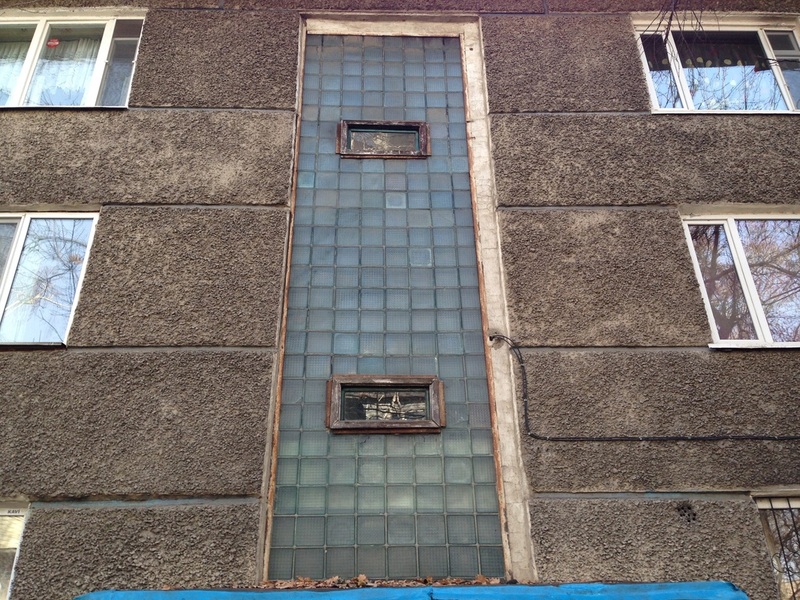 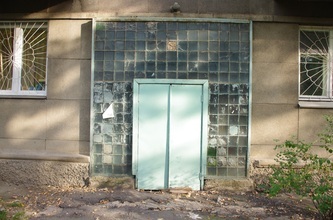 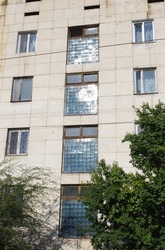 In the post-war era, Soviets also started using steklobloky to let light through the long walls of their manufacturing plants, but the glass blocks became even more popular for lighting up communal stairwells, or podyezds. 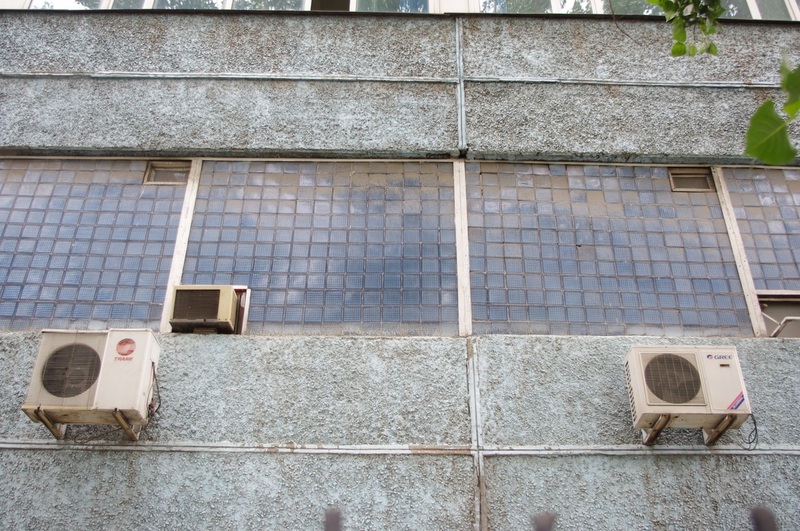 These spaces were usually warmed with just a couple radiators in the winter, and steklobloky kept in the heat more efficiently than your average windowpane. 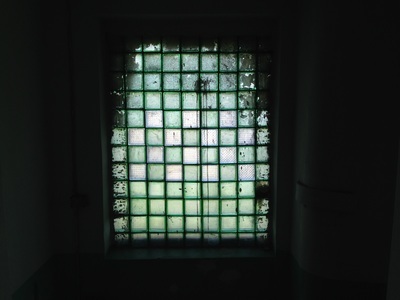 The ambient light also meant less need for lamps inside the stairwell. 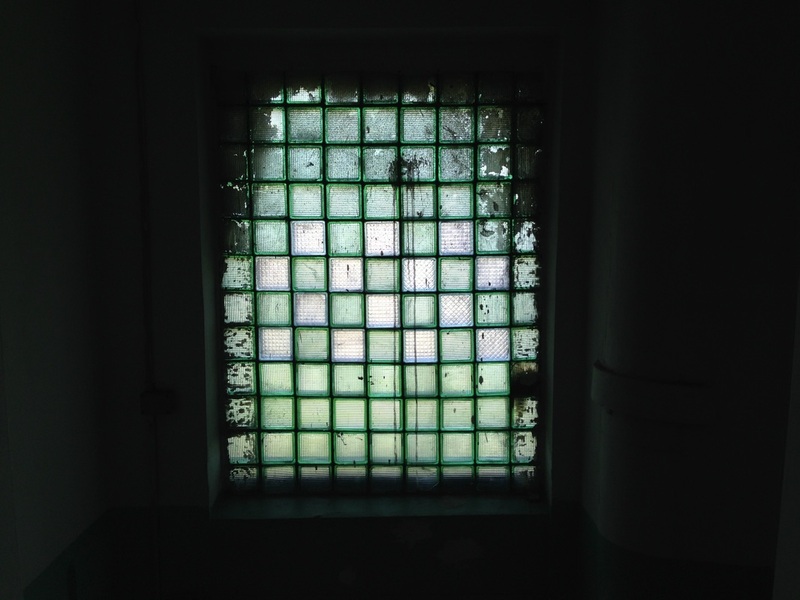 These days, a lot of stairwells have automatic lights, but back then they might've been kept dark at night. 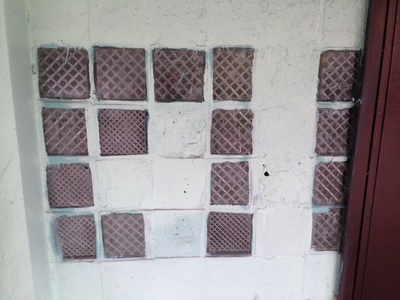 The blocks are translucent but not transparent, which means that some light is let in but other photons are scattered. 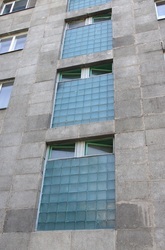 This is achieved by geometrical deformations in the glass and by the structure of the block itself - it is not one fat pane, but two sheets of glass sandwiching a chamber of air. 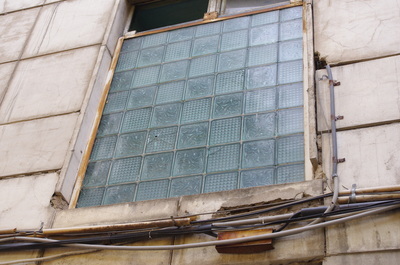 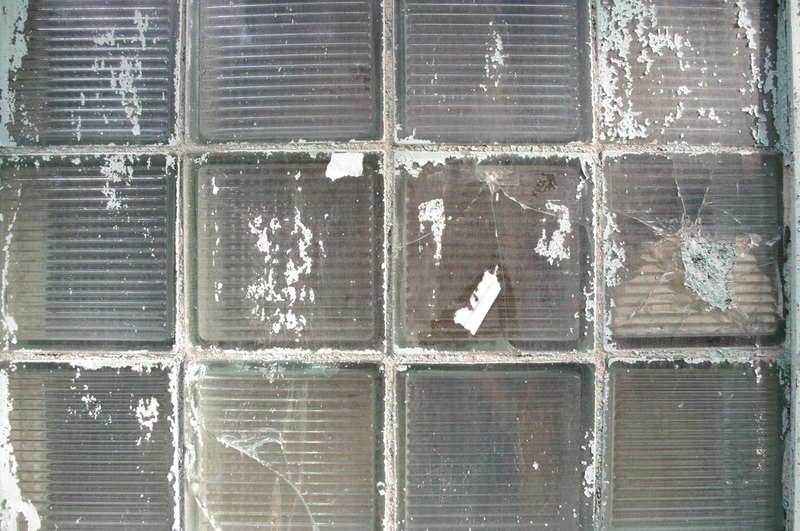 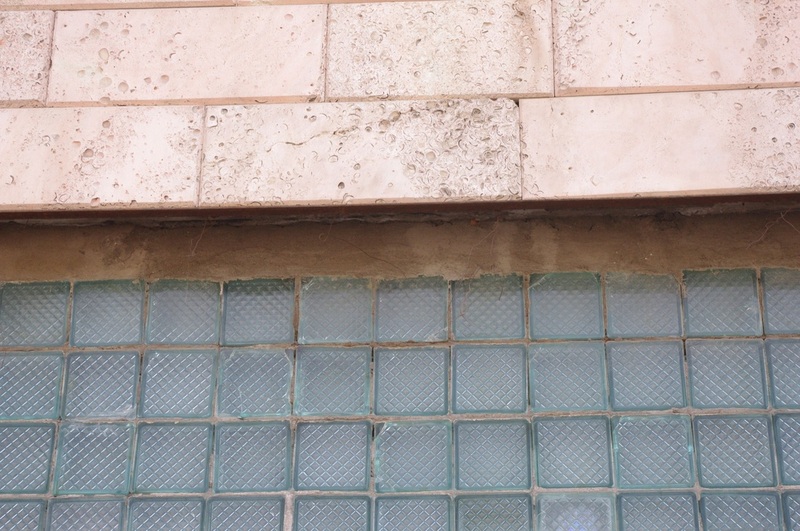 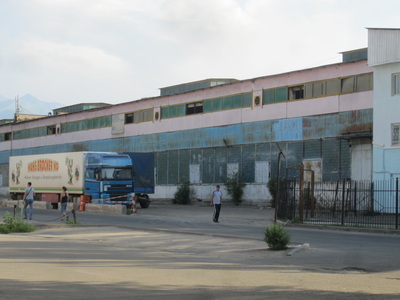 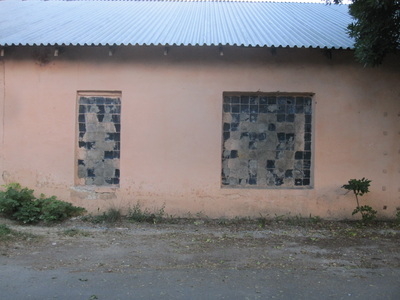 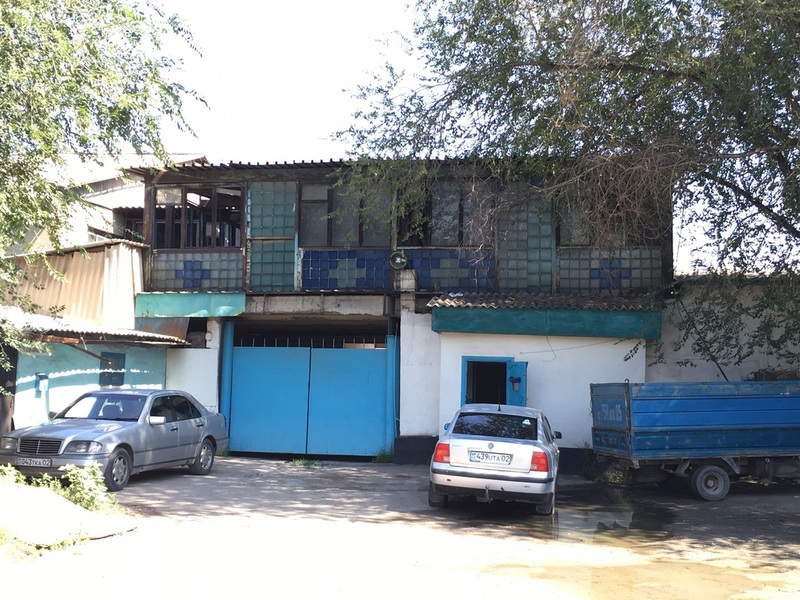 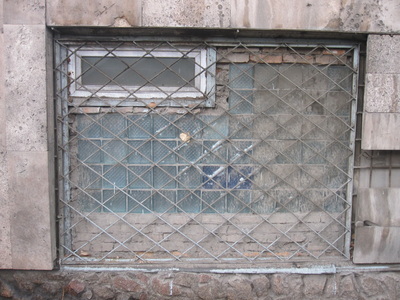 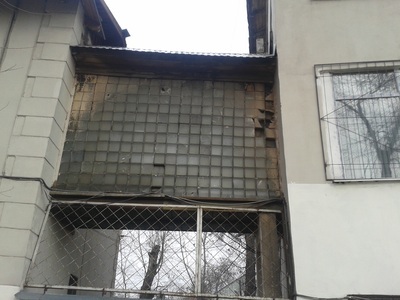 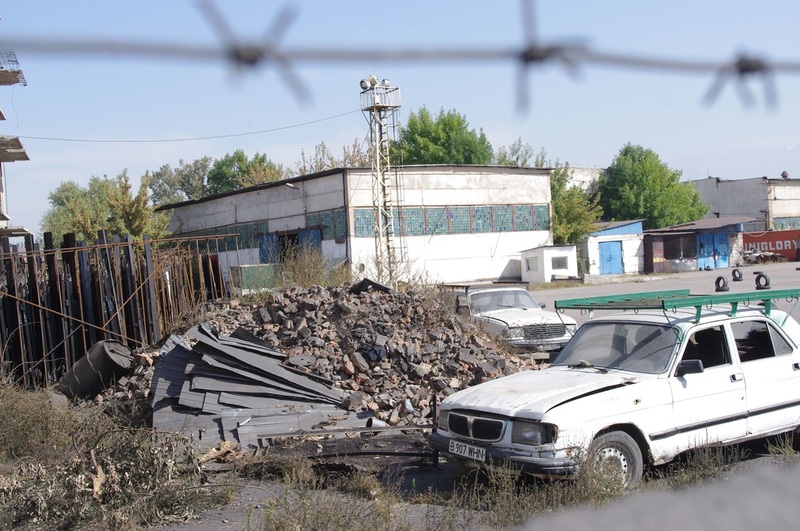 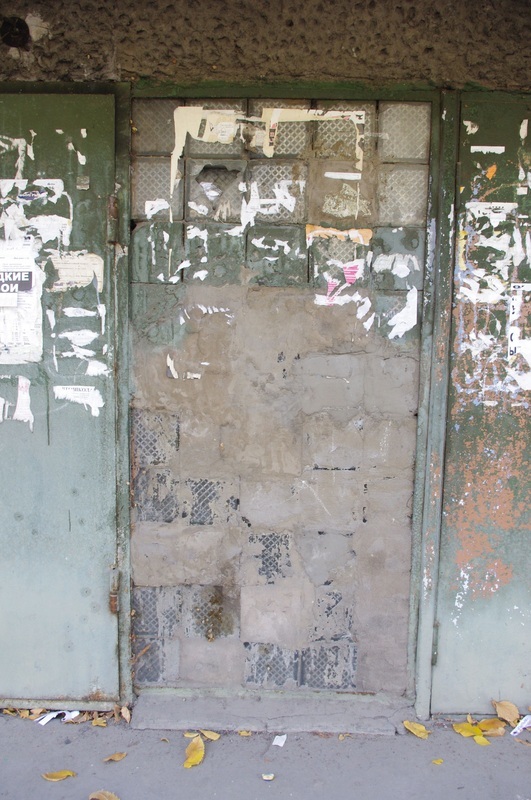 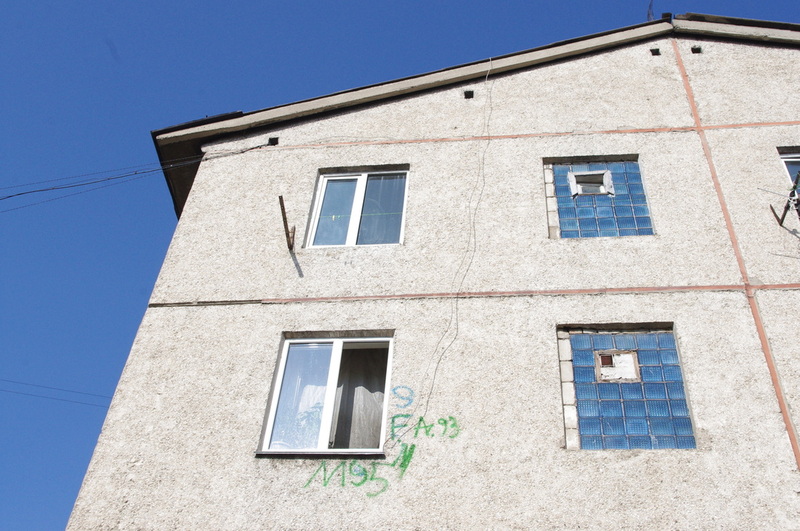 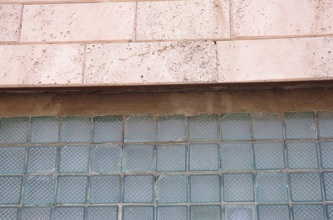 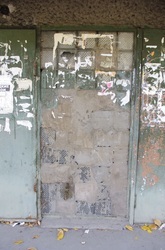 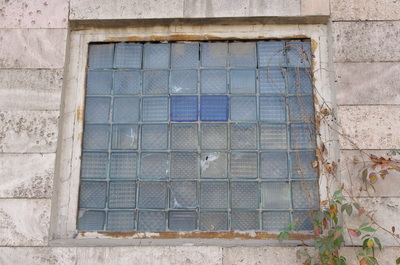 Especially in older factories that have been left to disrepair, you can see that some of the outer panes have been smashed, revealing the inner core. 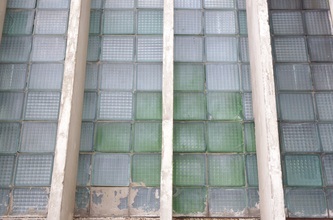 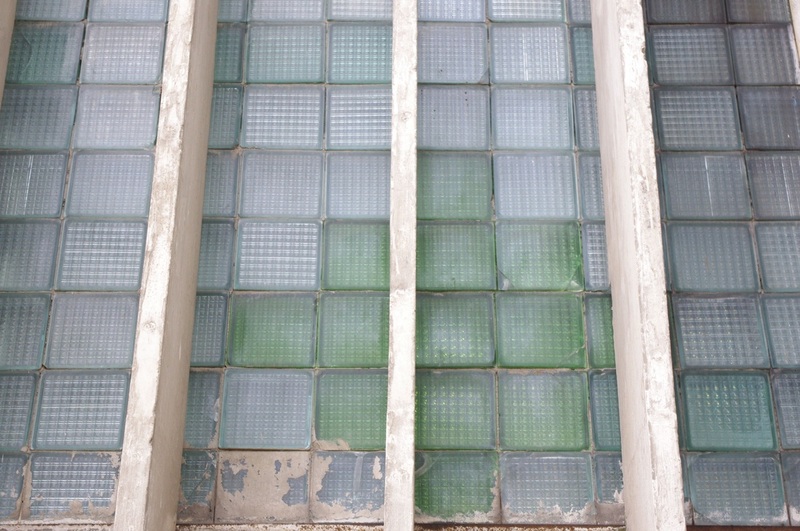 The glass could be injected with dye, making colored blocks that were easily used for ornamental effect. 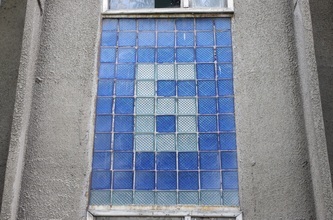 Sometimes they're arranged in rhombi, but my favorite is when they're used to spell out the number of the podyezd itself.